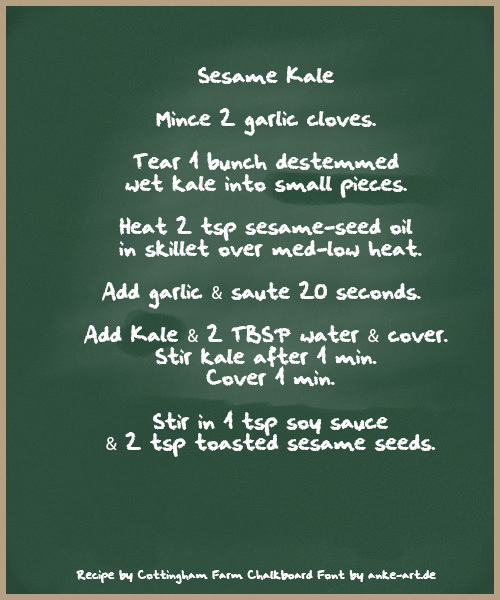 Sesame Kale Mince 2 garlic cloves. Tear 1 bunch destemmed wet kale into small pieces. Heat 2 tsp sesame-seed oil in skillet over med-low heat. Add garlic & saute 20 seconds. Add Kale & 2 TBSP water & cover. Stir kale after 1 min. Cover 1 min. Stir in 1 tsp soy sauce & 2 tsp toasted sesame seeds.